HYDRYAL 2% is an injectable non-cross linked hyaluronic acid clear gel 20 mg/ml that is designed to enhance skin hydration and restore skin vitality, improve skin elasticity and achieve a natural glowing look. The product is indicated to correct superficial lines, improve minor skin damages and hydrated and plump dry and aging skin. 2% is an injectable skin booster. Three-step needle mesotherapy based on uncrosslinked hyaluronic acid. 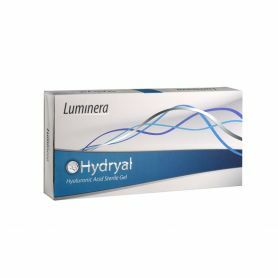 Hydryal consists of a highly purified form of hyaluronic acid. 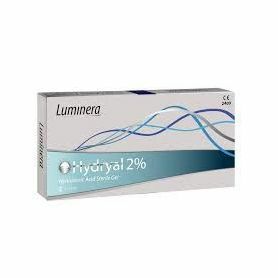 Hydryal 2% is an injectable non-cross linked hyaluronic acid 20mg/ml clear gel that is designed to enhance skin hydration and restore skin vitality, improve skin elasticity and achieve a natural glowing look. The clear gel is designed to enhance skin hydration, improve skin elasticity, and achieve a natural glowing look. Hyaluronic Acid is known for its many advantages; it contributes to the overall smooth and youthful appearance of the skin, thanks to its unique ability to bind and retain water, it can also bind to collagen and elastin and help transport vital nutrients to the skin tissue. The hyaluronic acid in Hydryal is very similar to the body's own hyaluronic acid in its composition. Dermal-epidermal junction and the superficial dermis. Forehead lines, temples, bridge of nose, oral commissures, lip lines, chin frown lines, crow's feet, cheek bones, nasolabial folds, marionette lines, jaw line, neck, decolletage. HYDRYAL 2% -3% -4% mésothérapy.